I was feeding and taking care of my dogs in the dark outside the Sands Motel in Hobbs, NM last February. (Getting them good food and making sure they were warm, watered and comfortable always takes place before we get comfortable ourselves- "The horse, the saddle, the man." was the priority of the US Cavalry at the end of the day and it makes a lot of sense to me.) Anyway, I was taking care of my dogs and another hunter walked up, introduced himself and we started talking hunting. He was from NC, a retired Game Biologist, Vietnam Vet and bird hunting nut like me. Robert and I decided we might as well hunt a day together. We had a great day chasing birds, telling lies and comparing dogs out in the NM desert. Robert was a confirmed setter man, but really liked my Brittany, Ace- his drive, nose and biddability. I allowed as how Ace would be siring pups in a bit and he allowed as to how he'd really like one. A deal was struck and I gave him the Pick of the litter. Little Lily came out of that- she was the only female and she's beautiful. She got the best of both parents- drive, smarts, nose and hunt. 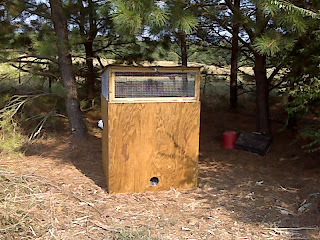 About a month later, Robert showed up and dropped off a Johnny House for me to keep birds in for training- made by him. I'm having a ball designing automatic watering and feeding for the birds to minimize human contact- it works pretty good. I let 4-5 birds out every day and by the next morning, they are back with their buddies slamming down breakfast and telling tall tales! For you non-bird dog folks, Johnny Houses are great for training, because you can release quail and let the dogs point them, etc., and they will fly back home to be used again and again. It's a real money saver- besides, its just fun to know they will come home every night for dinner!